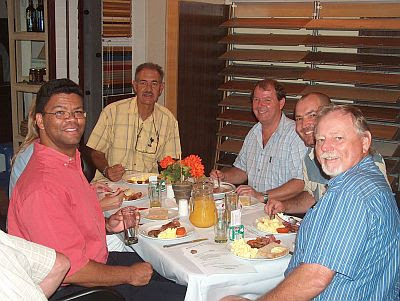 The first South Coast Kwazulu Natal Master Builders Association breakfast meeting, was held on 23 January 2009. It was a great success and was enjoyed by everybody who attended. Our sincere thanks go to Belcom/Building expo and Selected Table Ware Hire, who generously sponsored the meal venue and catering equipment. They have also offered to host the rest of the breakfast meetings planned for this year by our division. WELL DONE !! Domenico we enjoyed it. June Smit, Tony Steppe, Thys Blom and Hans Stols who kindly agreed to form a committee to organize social events and projects during 2009. Their first task is to arrange a MBA golf day for the South Coast Division. This event will not compete or interfere with the Annual Construction Golf day currently running as an annual event. Hans Stols for organising the event. Invitations to breakfasts will be made to all South Coast members during the year. Where possible the breakfasts are to be limited to small groups so that that everyone can meet one another in an informal and relaxed atmosphere. Members are encouraged to use the opportunity to present ideas and make suggestions as to how the Association can improve service to its members.